The Bharatiya Janata Party (BJP) is all set to strengthen its “Main Bhi Chowkidar” campaign. Very few days are left to go for Lok Sabha election 2019. Today, on the eve of Holi, Prime Minister Narendra Modi will address over 25 lakh Chowkidars through audio bridge medium and will also share the colors of Holi with them. Rajya Sabha MP Anil Baluni and Party’s media head said this is a part of a series of initiatives under the ‘Main Bhi Chowkidaar’ outreach programme. Baluni marked that watchmen work round-the-clock even without taking any leaves, therefore PM Modi’s initiative is to focus at highlighting the works of people like them and added that it was a necessary measure for developing the lot of the last man in line with the party’s motto of ‘Sabka Saath Sabka Vikas‘ (With all, development for all). He further asserted that the people from different walks of life lent their support to the ‘Main Bhi Chowkidar‘ campaign. With PM Modi prefixing ‘Chowkidar’ to his Twitter handle, the party launched its ‘Main Bhi Chowkidar‘ campaign on Saturday. Many BJP leaders including party president Amit Shah and several Union Ministers followed suit and pre-fixed ‘Chowkidar’ to their names on the microblogging site. Not only they added Chowkidar to name, but also released its ‘Main Bhi Chowkidar’ caller tune on Wednesday. And, many cellular networks are providing facility to their subscribers to access and download the caller tune. Many people are joining the movement and sharing it on social media. “You may now make #MainBhiChowkidar song as your Caller Tune. • Dial 57878617 from your Airtel mobile phone. • Dial 53711116475 from your Vodafone mobile phone. • Dial 5678911116415 from your Idea mobile phone. You may now make #MainBhiChowkidar song as your Caller Tune. On Tuesday, Ravi Shankar Prasad, Union Minister, declared that with the ‘Main Bhi Chowkidar’ hashtag, the campaign has become a “people’s movement” tweeted 20 lakh times and had 1680 crore impressions. After today’s conference, the Prime Minister is also scheduled to interact on 31st of this month with all people who have pledged to support the Main Bhi Chowkidar campaign from 500 places in the country. 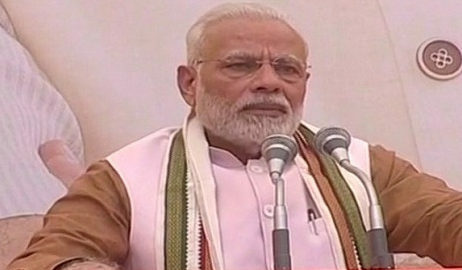 After the Indian Air Force fighter planes hit a Jaish-e-Mohammed terror camp across the Line of Control in Balakot, Khyber Pakhtunkhwa, the Cabinet Committee on Security headed by Prime Minister Narendra Modi holds a meet. Twelve days after the Pulwama terror attack which left 40 CRPF jawans dead, the strike on terror camp comes. This all occurred on 14 February when a Jaish terrorist rammed an explosive-laden vehicle into a CRPF convoy on Jammu-Srinagar highway. According to some sources, at around 3.30am the IAF fighters used Mirage-2000 jets with laser-guided bombs weighing 1,000 pounds. The meeting was held at the Prime Minister’s residence at 7, Lok Kalyan Marg in New Delhi. It was the second CCS meeting in less than two weeks which was attended by Defense Minister Nirmala Sitharaman, National Security Advisor Ajit Doval, Finance Minister Arun Jaitley, External Affairs Minister Sushma Swaraj, Union Home Minister Rajnath Singh, and other Senior Officials. The first one was a day after the Pulwama attack, February 15. The Prime Minister had declared after the first meeting that the security forces are given a “free hand” to deal with the Jammu and Kashmir terrorism attacks. Hours after the conference held at PM House, Foreign Secretary Vijay Gokhale gave out the details of the audacious operation executed by the IAF. In the press conference, he confirmed the daring strikes by IAF on Jaish-e-Mohammed (JeM) hideout terror camps in Balakot, as Balakot is believed to be the biggest JeM hideout in Pakistan. “In an intelligence-led operation, India struck the biggest Jaish facility in Balakot on early hours of Tuesday, in which top leaders have been eliminated. India calls it non-military pre-preemptive action to counter multiple potential fidayeen attacks. Many of the political people took to social media and posted regarding Air Strike Today. “Today’s strong action shows the will and resolve of a New India. Today's strong action shows the will and resolve of a New India. Our New India will not spare any acts of terror and their perpetrators and patrons. Two-day party’s National Convention began on Friday in Delhi. As the party seeking to prepare the workers for the battle of the 2019 Lok Sabha Elections, around 12,000 BJP members were gathered at the Ramlila Maidan. On the first day, Amit Shah (BJP President) gave an hour-long speech in which he spoke about Ram Mandir issue and said that temple should be built at the earliest. Also, accusing the Opposition he said, Congress Party is putting “hurdles” in the resolution of the issue. He stated that the Modi Government is making all efforts to ensure that the results in Ayodhya hearing by Supreme Court will be positive as well as faster. BJP President’s statement on Ram temple issue brought the most enthusiastic response from thousands of members who were present there. Further, Shah thanked the Prime Minister for the 10 percent reservation for upper caste poor and relief in Goods and Services Tax (GST) rates on behalf of the National Council members and the party workers. He also extended a special welcome to Prime Minister Narendra Modi. BJP workers and members associated to the party also saw hoardings related to the government’s pro-poor schemes, the recently passed quota bill which offers reservation to economically weaker general castes as well as the enhancing of the minimum support price to farmers. After Amit Shah’s presidential speech, PM Narendra Modi broke security protocol and met BJP office bearers. Also, PM shook hands with the party workers. Today, on the second day of the party’s National Convention, Prime Minister Narendra Modi will be addressing Bharatiya Janata Party (BJP) cadres in Delhi. He will conclude the two-day National Convention event which began yesterday with his valedictory address. On Monday, PM Modi introduces a commemorative coin worth Rs 100 in honor of Former Prime Minister Atal Bihari Vajpayee. It is the highest denomination of coin in India. The former PM Atal Ji served best of his 93 years and died at the AIIMS in the national capital following a prolonged illness. It is his 94th birth anniversary on Tuesday. Many political figures were present at the event including Finance Minister Arun Jaitley, Lok Sabha Speaker Sumitra Mahajan, BJP National President Amit Shah, Minister of State for Culture Mahesh Sharma, veteran BJP leader, and Vajpayee’s contemporary LK Advani. “The party which Atal Ji built has become among the largest political parties. Generations of Karyakartas were fortunate to be mentored by him. As a speaker, he was unparalleled. The party which Atal Ji built has become among the largest political parties. Generations of Karyakartas were fortunate to be mentored by him. Atal Ji wanted democracy to be supreme. He built the Jana Sangh but when the time came to rescue our democracy he and others went to Janata Party. For some people, power is oxygen…they can't live without it. On the front face of the coin, there is national emblem along with its value—Rs 100 which is inscribed below the emblem. Also, the words ‘Satyamev Jayate’ are inscribed below the Lion Capital of Ashoka Pillar in Devanagari script. Moreover at the right and the left of the coin, the words ‘Bharat’ (in Devanagari) and ‘India’ (in the Roman script) are inscribed. On the reverse side of the coin, there is a picture of Atal Bihari Vajpayee. Again, in both Devanagari and Roman script, the former Prime Minister’s name is inscribed. Also, to mark the year of his birth and death, the years 1924 and 2018 are inscribed below Vajpayee’s portrait, respectively. Watch this full video where PM Narendra Modi is speaking at the programme of launching a commemorative coin in memory of beloved Atal Ji. After election results of Madhya Pradesh, Chhatisgarh, and Rajasthan, the BJP is determined to take on its opponent head-on in the run-up to the Lok Sabha elections 2019. It is decided that Prime Minister Narendra Modi will address over two dozen rallies by January end. They will cover around 122 seats. The party has never won in states like West Bengal, Kerala, Telangana, Odisha, Assam, Andhra Pradesh, and the other northeast states. On Thursday, Amit Shah, Party Chief called a meeting with the BJP’s central office-bearers at the party headquarters. All state unit presidents and general secretaries (organization) of all the state units were present there. According to some sources, Amit Shah stated that the defeat in Chhattisgarh, Madhya Pradesh, and Rajasthan must not stop them, though the message of the people should be respected. Amit Shah highlighted that the rate of votes polled by the BJP, especially in MP and Rajasthan, is remarkable. Also shows people have faith in the party. So, we should try not to disappoint them. It is not the first time as PM Modi has already done this rally exercise in the 2013-14 election and set to repeat it in the run-up to 2019. 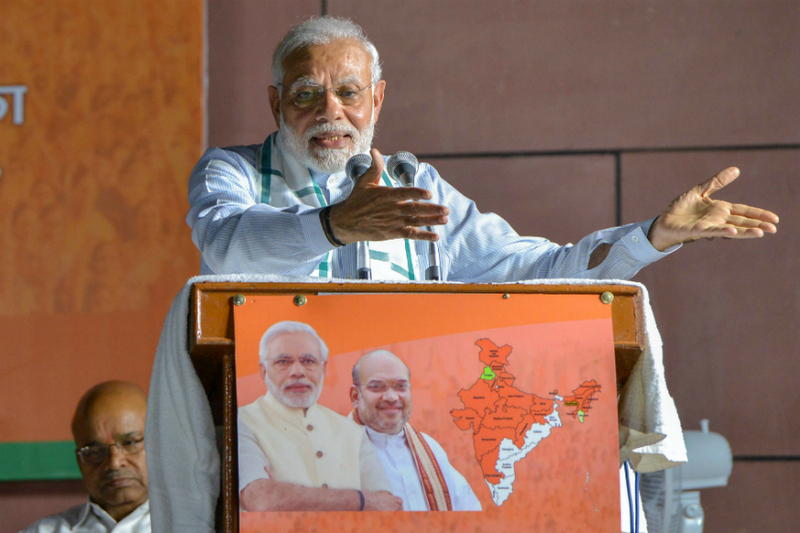 According to reports from the party, in initial days of next week, Modi will address rallies in regions where the BJP has never won mainly in Odisha, West Bengal, south India (barring Karnataka), Assam, and the northeast. The party has identified 122 such constituencies where the campaign will be strongly executed in the initial phase. Most probably he will cover these 122 such constituencies by January end. They will attempt to cover 2-5 seats in each public meeting. The list of targeted seats comprises two Lok Sabha constituencies in both Andhra Pradesh and Telangana, 17 of the 18 seats in Kerala, Silchar, and Dibrugarh in Assam, Tamil Nadu, Odisha and 40 seats out of 42 in West Bengal, and all the seats which are never won by BJP in the northeast. Along with PM Modi, Amit Shah will also hold several rallies in various states. And, apart from Modi and Shah, Union ministers Nitin Gadkari, Rajnath Singh and others will also hold the rallies. Not only rallies but BJP is also planning to reach out to the voters to educate about welfare schemes. Besides all, PM Modi will also address a rally of women on December 22 which is organized by the party’s Mahila Morcha in Ahmedabad, Gujrat. BJP’s Party President Amit Shah who turned 54 yesterday received birthday greetings from Prime Minister Narendra Modi and several party leaders. PM Modi praised him for his rigor, hard work, and leadership which happens to be an asset to the party. In reply to PM Modi’s wishes, Shah said that every party worker of BJP is working tirelessly under his “inspiring leadership” to realize the dream of a “New India“. “Thank you Honourable Prime Minister Shri Narendra Modi for your kind wishes. I assure you that every BJP karyakarta, under your inspiring leadership, is working tirelessly to realise the dream of a #NewIndia,” tweeted Shah in reply. Various other leaders of the BJP and its allies also gave the best wishes to the party president on this day and lauded his leadership. Warm wishes to BJP National President Shri @AmitShah on his birthday. Amitji is known for his hard work and amazing organising skills. Under his leadership the party has risen to new heights. I pray for his healthy and long life. Birthday wishes to @AmitShah ji, who has provided an able and dynamic leadership to BJP. He has transformed the way grassroot politics is conducted in India. Today is our country’s most loved Prime Minister Shri Narendra Modi Ji birthday. PM Modi was born on September 17, 1950, in Vadnagar Gujarat. He turns 68 today. He will celebrate his birthday in his constituency Varanasi today and will stay overnight in the holy city. PM Modi will celebrate his birthday among children of a primary school aided by a not-for-profit organization. According to the officials, he will pray Lord Shiva in Kashi Vishwanath Temple and then later watch a movie Chalo Jeete Hain with children. “On his 68th birthday, PM Modi will watch a 32-minute film “Chalo Jeete Hain” with the school children. He is also likely to inaugurate several development projects worth crores of rupees,” senior officials said. Apart from this, BJP in Tamil Nadu celebrated our Prime Minister’s birthday by gifting gold rings to newborns. Leaders from various political parties took social media handles to convey their hearty wishes to the beloved Prime Minister. Various organizations have planned celebrations at prominent places in the city. Moreover, BJP workers have made special arrangements on occasion to cut cakes and distribute sweets. Tomorrow he will inaugurate Integral Power Development Scheme(IPDS) and Atal Incubation Centre at Banaras Hindu University(BHU). Later, he will lay a foundation stone for a regional ophthalmology center followed by a speech at BHU. Here are various tweets on social media handles conveying warm greeting to the Prime Minister.
.@narendramodi A very happy birthday to Hon’ble Prime Minister. I wish him long and healthy life. Prime Minister Narendra Modi greets the nation on the occasion of Teachers’ Day. He extended his greetings to the teaching community who are devoted to nurturing the future of the country. “On Teachers’ Day, I salute the teaching community that is devoted to nurturing minds and spreading the joys of education in society,” PM Modi tweeted from Xiamen, China where he is attending the 9th BRICS summit. Greetings to the teaching community on the special occasion of #TeachersDay. Teachers play a vital role in the shaping of young minds and building our nation. Teachers’ Day is celebrated every year on 5th September to mark the birth anniversary of the great philosopher, academician and country’s second President Dr. Sarvepalli Radhakrishnan. “My tributes to Dr. S. Radhakrishnan, an outstanding teacher and statesman on his birth anniversary,” PM Modi said. “Let us make the next five years about ‘teach to transform, educate to empower and learn to lead’,” the Prime Minister added. Apart from this, the BJP President Shri Amit Shah also wished the entire nation and the teaching community on the occasion of Teachers’ Day. He tweeted, “The skills and knowledge of a teacher not only educate a child but also helps in shaping his or her future. On Teachers’ Day, let us salute the commitment and dedication of all the teachers for their unparalleled contribution in nation building”. The skills and knowledge of a teacher not only educate a child but also helps in shaping his or her future. Ahead of Teachers’ Day, PM Modi also interacted with the national award-winning teachers on September 4th to felicitate the teachers selected from all over the country for their innovative work in the teaching sector. Prime Minister Narendra Modi, BJP President Amit Shah, and all CMs of BJP-led states gather at the BJP headquarter for a strategy meeting in New Delhi. The meeting was focused on the strategy for the upcoming 2019 elections and the assembly elections in Chhattisgarh, Madhya Pradesh and Rajasthan which are to be conducted later this year. The party indicated on Tuesday that the main agenda for 2019 polls would be the developmental work and identity politics. While briefing the media persons, Chhattisgarh Chief Minister Raman Singh said that the party member renewed their commitment towards bringing back PM Modi with a stronger majority, during the meeting. Party President Amit Shah listed center’s initiatives. It also included National Register Of Citizens(NRC) in Assam and Citizenship (Amendment) Bill which were tabled in Lok Sabha in 2016. Both are controversial enough to create a hype in identity politics. The amendments to the Citizenship Act, 1955, seek to allow citizenship status to some “persecuted minorities” — Hindus, Christians, Parsis, Sikhs, Buddhists, and Jains — from the neighboring countries of Bangladesh, Pakistan and Afghanistan after six years of residency. “The BJP’s stance on NRC is clear — there is no place for foreign infiltrators in this country,” said Singh, as per Shah’s speech. He added that India should accept Hindus who flee countries like Afghanistan and Bangladesh. Moreover, the CMs of the party-ruled states discussed the flagship programmes of the government with all the details about their implementation in the states. Both the party president Amit Shah and PM Modi encouraged all the Chief Ministers to campaign on the NDA government’s legislative achievements — passage of the Bill, seeking constitutional status for the National Commission for Backward Classes (NCBC), amendments to the SC and ST (Prevention of Atrocities) Act. “The constitutional status for the backward classes commission was a long-pending demand. Despite its majority in the past Lok Sabhas, Congress could not get it done for generations,” said Singh. BJP All Set to Turn The Heat on BJD in Odisha by Rallying on 26th May? While getting out of Karnataka, BJP has now turned its focus to Odisha. And the latest reports suggest that PM Narendra Modi is all set to address a rally in Cuttack on 26th May to mark it as the 4th anniversary of Modi government. The announcement came when BS Yeddyurappa resigned as CM after failing to prove his majority in the state. The president Amit Shah’s comment that the ‘golden period would not come for the party till it won in the states like Odisha, Kerala, and WB, this announcement is the proof of the importance of Odisha in party’s scheme of things for the 2019 elections. No doubt, the state is utmost important for BJP for two reasons, initially the party has been in the power, though only in alliance with BJD (Biju Janata Dal)for 9 years and it is seen as one of the states where it can gain few Lok Sabha seats to offset the losses that can be expected to suffer in UP, Gujarat, MP and Chhattisgarh. Another reason the party is banking on an undercurrent of anti-incumbency against Naveen Patnaik government that has controlled the state continuously for 18 years. PM’s rally is important because it strengthens the BJP’s scarcely efforts to turn back to the glorious past of state, a trick that had paid rich dividends in Assam polls last year. What would be Mr. Modi’s visit after coming to power, the PM would list all the achievements of the government in last 4 years and would ask for the final assessment from the Naveen government for 18 years in power. Well, it is clear that BJP is in no mood to walk over to the BJD in the Lok Sabha elections in 2019.